I’ve tried making bolognese sauce a few times in my life and was never impressed. I blamed the bolognese. But what I should have been blaming were the recipes I was trying. 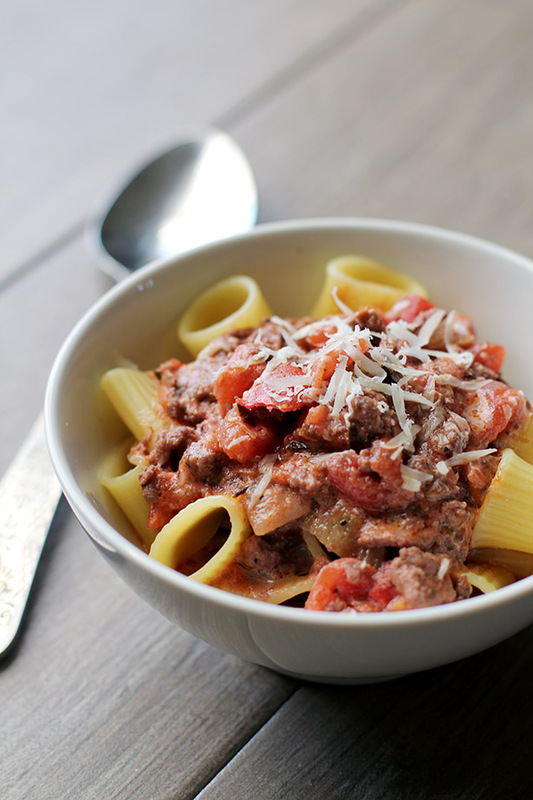 Today I have a recipe that is divine and completely changes how I feel about homemade bolognese sauce. This past Christmas I found myself with a half a pound of ground veal left over from making Swedish meatballs. 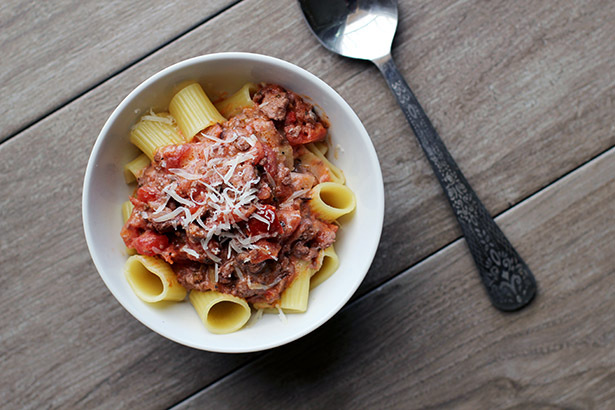 I searched around the web for recipes to use up the veal and happened upon this recipe for veal bolognese from Food & Wine. I didn’t follow the recipe exactly but used it as a guide and oh my GOODNESS the resulting sauce was so, so good and flavorful and wonderful and, well, I am finally impressed by homemade bolognese sauce. I think one of the reasons the sauce was so good was because I used half veal, half regular ground beef. But I’m quite certain the sauce will still be uber delicious with straight ground beef, as the veggies and spices are what really make this sauce shine. If you want to use veal, by all means do. But ground beef alone is a-okay. Click here for the original recipe, which also includes butternut squash, which I am sure is delicious! Below is my version of homemade bolognese sauce, with some modifications from the original recipe. Oh, one more note! I used a rigatoni-like pasta instead of spaghetti and really liked that shape of pasta with this sauce. Use whatever pasta you like, but the rigatoni is quite delicious. Adapted from a Food & Wine recipe. In a large cast-iron casserole (or pot), cook minced bacon in the olive oil over medium heat, for about 5 minutes until bacon is well cooked, stirring occasionally. Add the carrots, celery, and onion. Sprinkle evenly with a pinch of salt and cook over medium heat about 5 minutes. Add the fresh garlic and stir. Add the ground meat along with the sage, parsley, bay leaf and oregano. If using dried basil, add that now as well. Season evenly with a few pinches of salt. Cook until meat is cooked through and no longer pink, stirring regularly. Add the wine and cook until the wine has reduced significantly, about 3-5 minutes. Add UNdrained tomatoes and cook until liquid is reduced by about half, around 5 minutes. Add the chicken stock and bring to a simmer over medium-high heat. At this point if you are using tomato paste, add that as well. (Note: originally I did not have tomato paste in the recipe. The sauce base originally came out with more of a broth consistency - still unbelievably tasty, but you have to serve the pasta in a bowl. This last time I added tomato paste and it helped to thicken the sauce base up and the flavor remained the same. I will be using the tomato paste in this recipe from now on). Reduce heat to medium-low and simmer gently for about 10 minutes. Remove the bay leaf. Add the cream and, if using fresh basil, the basil. Stir and add salt to taste if needed. Finish off with a few shakes of pepper. I like using the pork/beef mix that is common in Sweden for my bolognese and I also add in a teeny bit of vinegar!